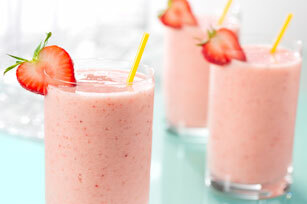 Creamy, fruity and delicious, these smoothies can be ready to sip and savour in just five minutes. Cut 1 corner off top of drink pouch with scissors; pour drink into blender. Add all remaining ingredients except ice; blend until smooth. Prepare using your favourite variety of Kool-Aid Jammers.